The last time I did any coding in VB was probably 11 years ago when I was 13 or 14 in high school. I used to take computer science as a seventh subject (learning Turbo Pascal) and dabbled in a bit of Visual Basic in my spare time. I created a computer mouse / keyboard training application for a local pre-primary school that helped the kids (4 year olds) learn to use a PC and develop their hand-eye coordination. 1. 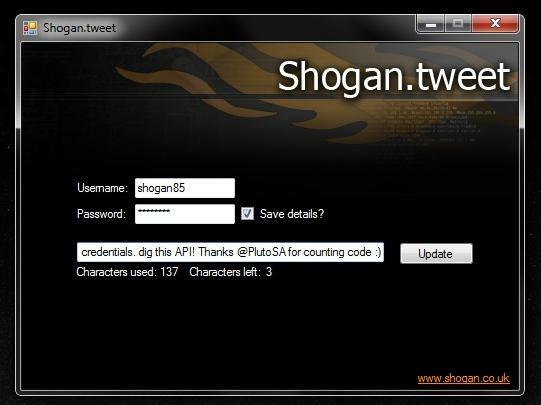 Twitter username and password entry with option to save these details on the local PC. 2. An area to type your actual “tweet” with character limit counters (you can only have 140 chars per tweet). 4. A quick logo that I did to make the interface look a bit more interesting. I will follow this post up soon with some detail on how I did the coding itself (as requested by c0d3r and youknow – for the purposes of ridiculing my noob vb code!). Nothing special though – I just followed a couple of tutorials that I found on the net. Also thanks to PlutoSA for refreshing my memory on doing a counter!